We stopped here last weekend for smoothies on a recent trip to Launceston. The smoothie was delicious, the staff friendly and the service quick - no faults there. I was very disappointed though to receive my smoothie in a single use plastic cup - so very wasteful! To their credit, they did at least provide a paper straw. I can only hope they put the cup in the recycling bin! I’d been looking forward to trying out this dear little cafe, the coffee was ok and the carrot cake muffin was amazing, probably the best muffin I’ve ever had. Unfortunately my experience was ruined by the noisy staff and I couldn’t get out of there quick enough. One of the staff talked so loud she was roaring and the other women wasn’t much better. Both women greeted regulars with cheer which is great but they were so loud and over the top it quickly got on my nerves. This could be such a lovely place if only these women would realise the space is very small and noise is amplified. I won’t be back, I like my coffee in peace. Dropped in for a morning coffee and was most satisfied with a perfect short black espresso that would hold its own in my home town Melbourne. Definitely will be a regular drop in for me when in Launceston. This very cute shop in George Street is quite historic. A barber shop for a very long time. Great that the new owners have maintained the old features and charm (including the name). Bright & clean. Great booths to chat and dine in (though I was alone today). Only had the cauliflower and leek soup but lots of brunch/lunch options under the glass. Served with nice bread. Delightfully tasty and comforting at $10. A nice lunch break! 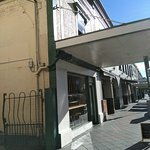 Been to Albertos Espresso? Share your experiences!